Most iPhone developers start up next to a full time employment by getting signed up for the Individual iOS Developer Program. For my recent workshop I researched the various kinds of programs that Apple offers and what the differences are. I omitted the column that was titled “Registered Developer” since it did not have any benefits besides being able to download the current stable Xcode version. Here is an overview of the subtle differences and how I got my Individual account changed to a Company account. I took the comparison available on Apple’s website and made a nicer table out of it, you might want to bookmark this for future reference. As an Individual you get access to BETA software, get 2 tech incidents, and can test on device, do ad-hoc and app store distributions. You are limited to 100 devices which you can provision per year. The University program is only good for creating teams of developers who then will be able to test stuff on their devices. This is available for Free because Apple loves Edu. 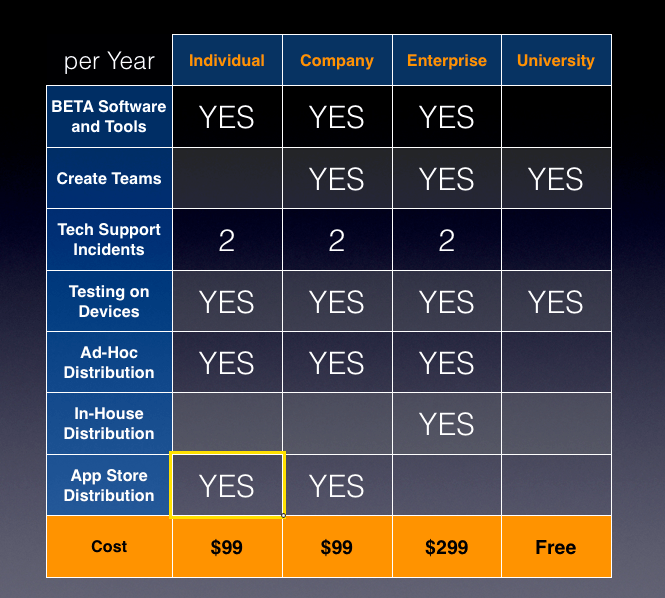 The Company and Enterprise options are almost identical with the only difference that enterprises are able to do unlimited in-house distributions but cannot put apps on the app store. Company program members on the other hand can also only have 100 devices, but have the benefit of being able to publish apps on the app store. If a big corporation needs both options (in-house AND app store) then the only way to get that is to sign up for both programs. Apparently you may combine them. Individual and Company are virtually identical as well, with the only difference of Company being able to create developer teams. Even the price is the same. So what is this “Create Teams” and why would I need that? Well, if you work with more people than just yourself you also want these other team members to be able to provision their devices and test on them. And that’s what this gives you. 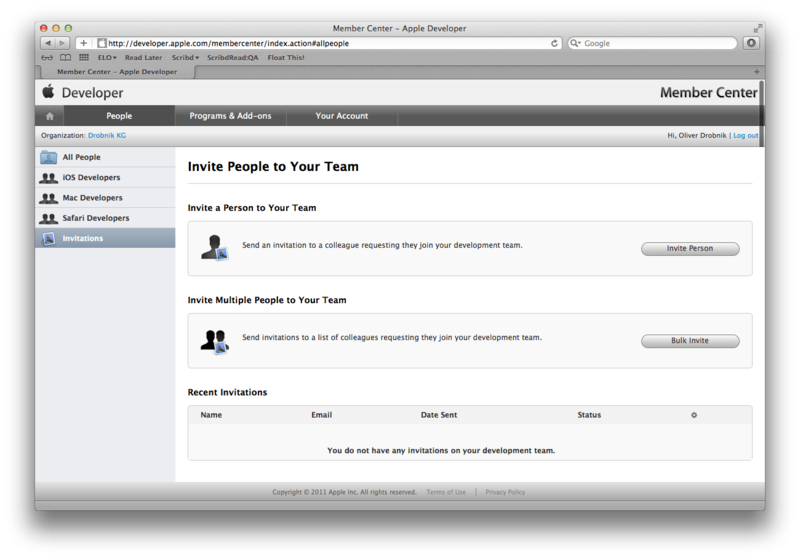 You can invite their Apple ID to join your development team. The question at hand is, why does Apple make this distinction and what is needed to reap the benefits of the Company account? Apple does not care what kind of business you have registered if it is only a single-person-endeavor. You need to have a company to be eligible for the Company program, company as in “multiple people”. A sole proprietor or “person company” (sometimes also e.U.) does not qualify because he is just by himself legally, i.e. an Individual. In Austria you have various kinds of companies that do qualify: OG, KG, GmbH and AG. As a rule of thumb, if you needed more than a single person to found it or there was a certain amount of capital necessary for the founding of the company then it works. The proof for your legal standing as a company is a copy of the company registration which you have to fax to a dedicated phone number in USA. Yes, you heard me right, they won’t accept an e-mail with a scan. To simplify the work flows of several developers around me I decided to have my Invididual account be changed into a Company. To do so I called Developer Program telephone support for my country. The process has been streamlined so far that you can get the migration started right away. They warn you that your provisioning portal will not be accessible for up to a week during migration. There is no extra payment to make, your annual membership fee of $99 has already been paid. Once they kicked off the migration you receive an e-mail with a link asking you to complete your enrollment details. 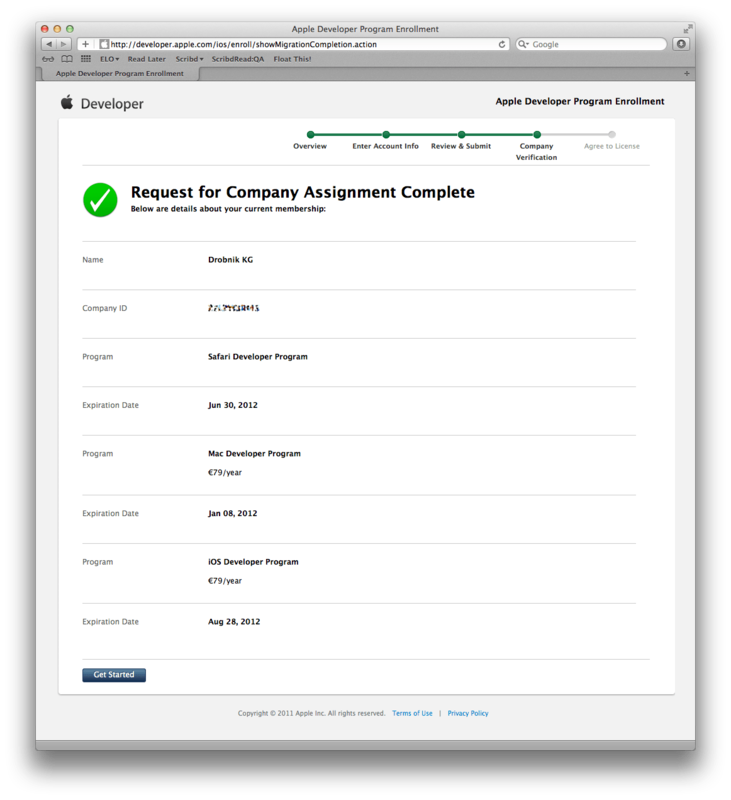 You see that this again tells you that the Company Program is intended for: Team Development and App Store distribution. Next you fill in some account info and the company profile which includes the company address and phone number. The last step before the first wait informs you about your new Enrollment ID. This is the actual identifier you need when communicating with Apple, sort of like and ID for your legal entity if you will. This new identifier replaces the previous one you had as an Individual. This also tells you that you will be contacted via e-mail to prove your company status. After a brief wait I received an e-mail to fax my company registration document to a number in the US and also specify the new enrollment ID plus company telephone number on the fax. Thankfully my tax advisors possess both a copy of my company registration as well as a fax machine. So I asked them to do me this small favor or faxing it. It’s a bit weird that there is no HTTPS-secured place that would accept an upload but that’s just the way it is. And that’s were we’re at right now, I will add to this blog post as further developments happen. Markus Mueller (of Mindnode) points out that getting a new Enrollment ID is a bad thing if you already have iCloud integrated because this invalidates any existing iCloud containers. Apparently this identifier is part of the address of space reserved for one user and one app. Update Oct 17: I phoned the Developer Support again, wanting to ask something about the VAT, only to find out that Apple did not like what I had faxed to them. The company register has to come from an official source instead of being just a copy from the internet. Will mail another version I have to the later. If you insist enough and stress that you know that you are doing it “at your own risk” then they will let you mail a scan. Shortly thereafter I received another quite friendly phone call telling me that my paperwork is now in order. Minutes later I received a link to the next step in the enrollment process, accepting the agreements. And finally a large green checkmark gives you a good feeling. It’s a bit weird that the green progress bar backtracked but the enrollment process was as complete as can be. The ability to invite people from your company to join your development team. The option to assign Team Admin privileges to other members on your team. 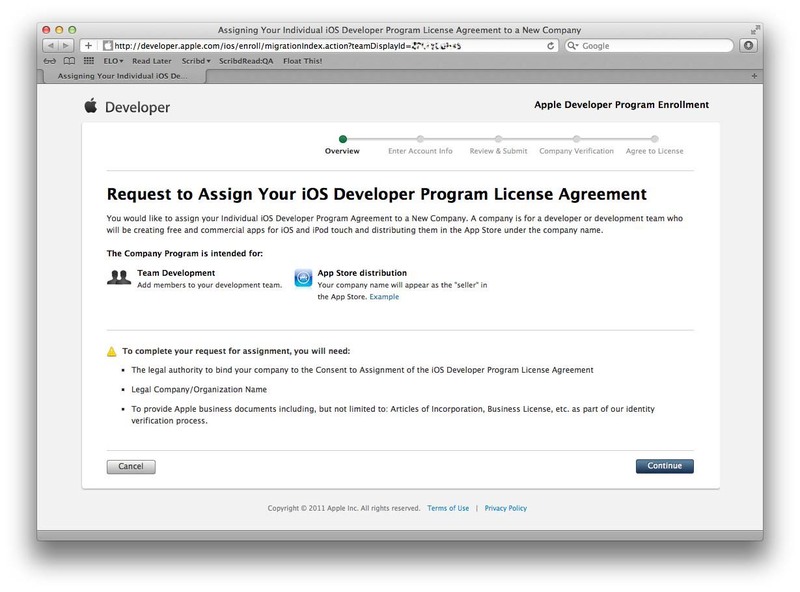 The ability to monitor and approve development certificates. So to check this out I logged into my member center which has adapted its look and lets me now invite people to my development team. Even with this brief hiccup on the company documentation the whole process was over and done with in 5 days total. One more thing … you have to update all your contracts, contacts, tax information and payment account. This is because you get new contract numbers for the company account. That’s not true. I have a one-man-company and I’m in the Company Developer Program. A sole proprietor, not incorporated. Then your company is a legal individual – so if your company goes bust, you don’t. Individual accounts are for real individuals and individuals who run one-man-companies that aren’t legal “persons”. 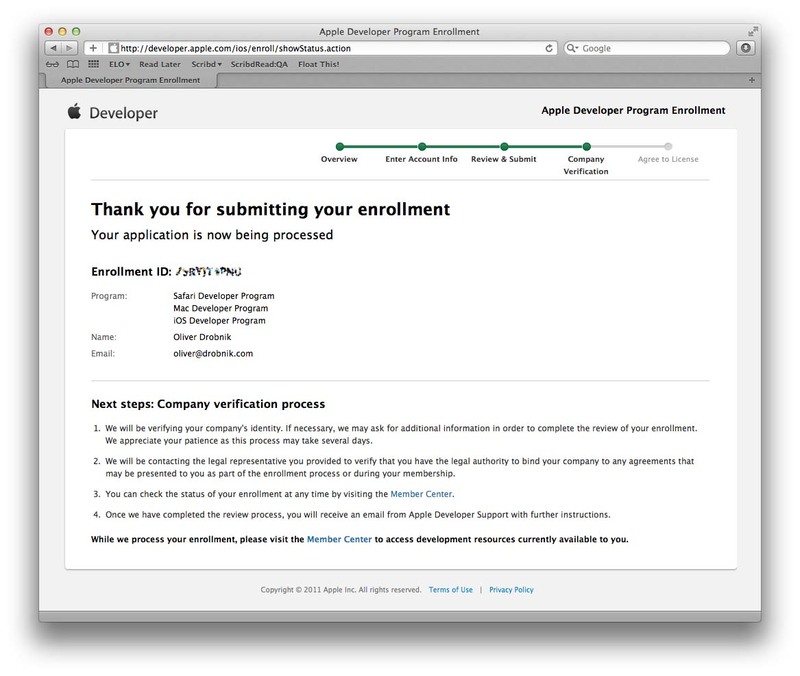 Hi, now i have register apple developer program for company. 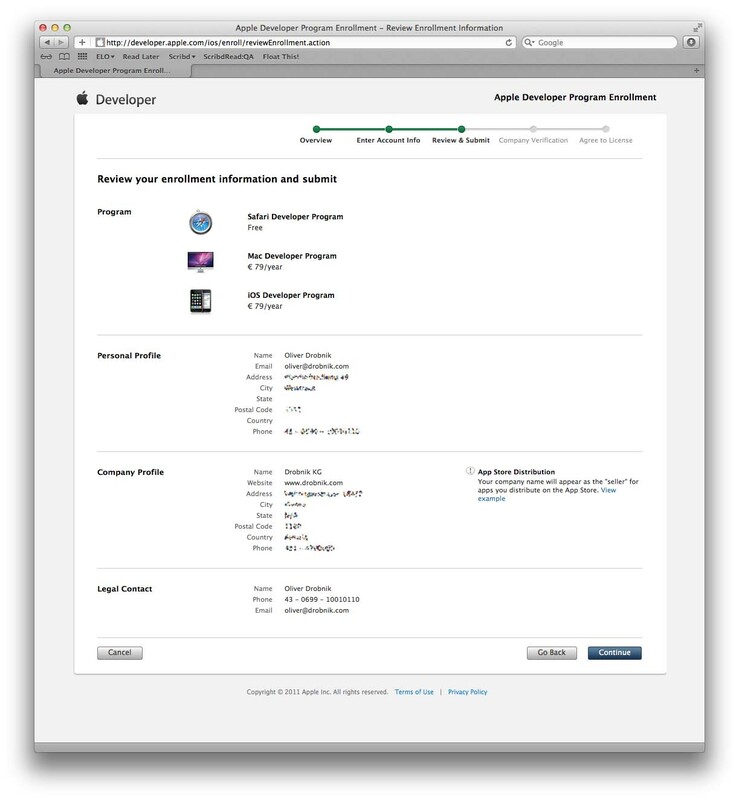 can i upgrade to apple developer organisation program ? The owner of the domain name iPhoneAppsDeveloper.net is selling his domain at quite a cheaper price. As per Google, the keyword has exact Searches of about 960 per month. probably be returning to reaqd more, thanks for the advice! hoverboard http://www.betterscooter.com/ long been quite a extraordinary winter months throughout Los angeles, we a blizzard. And thru everthing I got fashion and also dry up inside my Kensingtons. Typically the traction is actually comparatively fine, nevertheless usually I am inclined to wear your slush. Entire it was actually really decent.